Home » Cirugía » Which should be the gold standard laparoscopic technique for handling Spigelian hernias? Background The advantages and disadvantages of both extraperitoneal and intra-abdominal laparoscopic Spigelian hernia repair are still being discussed. To our knowledge, no study has compared both techniques in terms of safety, feasibility, and cost-effectiveness. Method Prospective data were collected to compare the results of the extraperitoneal approach with the intraabdominal approach in laparoscopic Spigelian hernia repair, between 2000 and 2012 (n = 16). Diagnosis was confirmed preoperatively by ultrasonography and/or tomography. Results Spigelian hernias occur mostly in women (69 %), on the left side (56 %) and at a median age of 62 (range: 38–83). In our study, the extraperitoneal technique was performed in seven patients, while the intra-abdominal approach was indicated in nine. No complications, readmissions, or recurrences were detected in either during a mean follow-up of 48 months (range: 18 months–9 years). The statistical study showed that there was no difference in either morbidity or the recurrence rate between a totally extraperitoneal (TEP) and an intraperitoneal onlay mesh (IPOM) repair. The mean duration of an IPOM repair was, though, shorter than that of a TEP repair (30 vs. 48 min, P = 0.06). The combined fixation technique (tacks ? glue) did not modify the results but did reduce the costs, as shown in the cost-effectiveness study where the intra-abdominal approach was cheaper (1260 vs. 2200 euros, P\0.001). Conclusion Laparoscopy seems to be a safe and feasible technique whichever the approach chosen, be it intra or extraperitoneal. 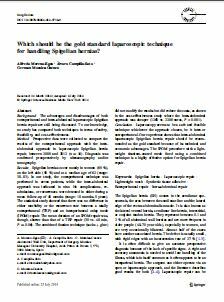 Our experience shows that intra-abdominal laparoscopic Spigelian hernia repair should be recommended as the gold standard because of its technical and economic advantages. The IPOM procedure with a lightweight titanium-coated mesh fixed using a combined technique is a highly effective option for Spigelian hernia repair.